The Great East window and uppermost panels of the lower east window. The recommended route now moves back from the quire to the crossing for a brief moment. Turning eastwards, the Great East window dominates the view. The east windows were the first to be completed, and were installed for the consecration of the cathedral in November 1887. Above the left and right sides of the reredos can be glimpsed the uppermost panels of the outer lancets of the lower east window, the rest being hidden by the reredos. The subjects and prominence of these two panels is an important part of Benson’s vision for the east windows, as will be seen later. Benson conceived the lower and upper windows as a theological whole.168 Together, the lower and upper East window is by far the largest in the cathedral, and indeed in the whole diocese. The recommended route now moves via the south quire aisle, to the Chapel of All Saints in the centre of the retro-quire behind the reredos. e1. The lower east window. e1 a. The left-hand light shows events of the Incarnation with, from bottom to top, the Annunciation to the Virgin Mary, the Visitation, the Annunciation to the Shepherds and the Adoration of the Magi. e1 b. The central light shows events of the Passion with, from bottom to top, the Last Supper, the Agony in Gethsemane, Ecce Homo and the Crucifixion. e1 c. The right-hand light continues the Passion sequence from the central light with, from bottom to top, the Deposition, the Burial, the Three Marys at the empty tomb, and the Resurrection. e1 1a. DIXIT · AVTEM · MARIA · ECCE · ANCILLA · DOMINI (And Mary said, Behold the handmaid of the Lord) ( Luke 1:38). The Annunciation to the Virgin Mary. The angel holds a scroll on which is written AVE · GRATIA · PLENA (Hail, thou that art highly favoured) ( Luke 1:28). e1 2a. BENEDICTA · TV · INTER · MVLIERES (Blessed art thou among women) ( Luke 1:42). The Visitation. Joseph stands on the left while Mary and Elisabeth speak to each other, and Zacharias stands on the right. e1 3a. TRANSEAMVS · VSQVE · BETHLEHEM · ET · VIDEAMVS · HOC · VERBVM (Let us now go even unto Bethlehem, and see this thing) ( Luke 2:15). The Annunciation to the Shepherds. The text around the angel reads NATVS · EST · VOBIS · HOC · DIE · SALVATOR (For unto you is born this day [in the city of David] a Saviour) ( Luke 2:11). e1 4a. LVMEN · AD · REVELATIONEM · GENTIVM (A light to lighten the Gentiles) ( Luke 2:32). The Adoration of the Magi. On the left stand Joseph in the background and Caspar kneeling before Mary and Jesus. On the right kneels Melchior and Balthazar stands behind him. There is a crown on the ground in front of Mary and Jesus. 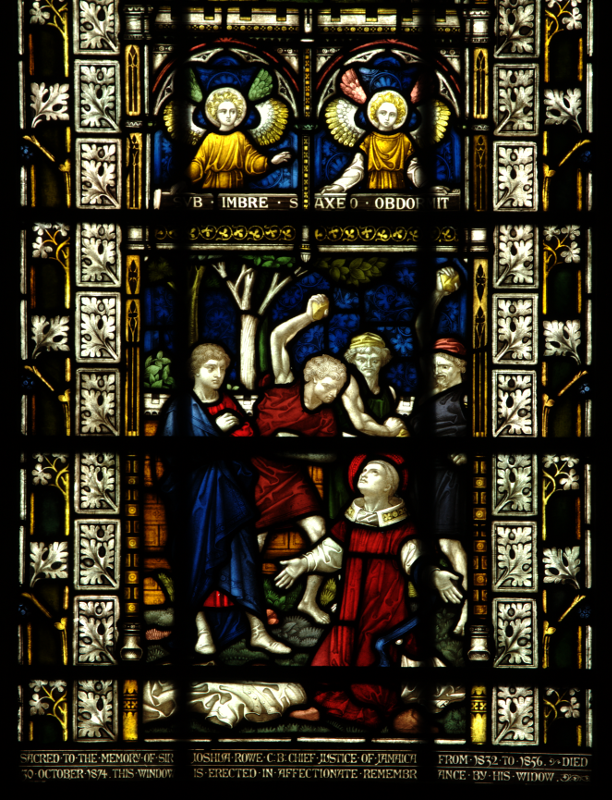 This scene and the Resurrection in e1 4c at the top of the right-hand light are the only parts of this window that are visible from the nave of the Cathedral. e1 1b. HOC · FACITE · IN · MEAM · COMMEMORATIONEM (This do in remembrance of me) ( Luke 22:19). The Last Supper. Judas sits with his eyes downcast, holding the bag of money that he was paid for betraying Jesus. e1 2b. NON · MEA · VOLVNTAS · SED · TVA · FIAT (Not my will, but thine, be done) ( Luke 22:42). The Agony in Gethsemane. An angel strengthens the praying Jesus, while the disciples sleep. e1 3b. PILATVS · DICIT · EIS · ECCE · HOMO (And Pilate saith unto them, Behold the man!) ( John 19:5). Pilate, second from the right, shows Jesus, wearing a crown of thorns and a purple robe, to the crowd. e1 4b. ECCE · AGNVS · DEI · QVI · TOLLIT · PECCATVM · MVNDI (Behold the Lamb of God, which taketh away the sin of the world) ( John 1:29). The Crucifixion. The figures standing are, from left to right, the Blessed Virgin Mary, Mary Magdalene holding a container of spices, the Roman centurion Longinus holding a lance and the disciple St John the Evangelist. Above the cross is the sacred monogram INRI, and below it on the scroll is ELI · ELI · LAMMA · SABACTHANI (My God, my God, why hast thou forsaken me?) ( Matthew 27:46). e1 1c. PLANGENT · EVM · PLANCTV · QVASI · SVPER · VNIGENITVM (They shall mourn for him, as one mourneth for his only son) ( Zechariah 12:10). The Deposition. The angels at the top hold the Crown of Thorns and the nails with which Jesus was fixed to the Cross. e1 2c. IBI · POSVERVNT · JESVM (There laid they Jesus) ( John 19:42). The Burial. Mary Magdalene anoits the body with spices from the vessel on the ground in front of her. Next to it lies the Crown of Thorns. e1 3c. DICITE · DISCIPVLIS · EJVS · QVIA · SVRREXIT (Tell his disciples that he is risen from the dead) ( Matthew 28:7). The Three Marys at the empty tomb. Mary the mother of Jesus is first, in blue, then comes Mary Magdalene in red, holding a container of spices, and then ‘the other Mary’. The two angels at the top hold a banner on which is written RESVRREXIT · SICVT · DIXIT ([He] has risen, as he said) ( Regina caeli, Queen of Heaven , ancient Marian Hymn). e1 4c. ET · VIVVS · ET · FVI · MORTVVS · ET · ECCE · SUM · VIVENS · IN · SECVLA · SECVLORVM (I am he that liveth, and was dead; and, behold, I am alive for evermore) ( Revelation 1:18). The Resurrection. This scene and the Adoration of the Magi in e1 4a at the top of the left-hand light are the only parts of this window that are visible from the nave of the Cathedral. The windows read from bottom to top. The left lancet depicts the Incarnation, with the Annunciation to the Virgin Mary, the Visitation, the Annunciation to the Shepherds, and the Adoration of the Magi. The central lancet jumps chronologically over thirty years in Christ’s life to depict the Passion sequence, with the Last Supper, the Agony in Gethsemane, Ecce Homo and the Crucifixion. The right lancet continues that sequence with the Deposition, the Burial, the Three Marys at the empty tomb, and the Resurrection. These are the only major windows in the whole building that are low enough for their artistic details to be appreciated from the cathedral floor. These panels contain some of the finest examples of design and glass painting in the whole Cathedral; a fitting tribute to the skills of the studio of Clayton and Bell, and their high status in the High Victorian Gothic Revival. The only obvious criticism of these windows is that the inscriptions are all in Latin, making them even more inaccessible in modern times to the average viewer than they were in the nineteenth century. This was a mistake that Mason came to recognise, and he later rectified it in the nave window sequence by reverting to inscriptions in English. In general, the treatment of each episode in the narrative closely follows Medieval and Renaissance artistic models: for example it is fascinating to see how closely the central tableau in ‘Taking Christ’s body down from the Cross’ is a mirror of Truro cathedral’s own 14th century Pieta in the South Aisle.171 The detailed iconography of all three lancets repays close study in artistic terms of composition, materials and detail. Each panel is composed to take full advantage of its landscape layout (most of the cathedral’s windows are in portrait layout). The vibrancy of the antique stained glass stands out, particularly in the use of rich blues and rubies. The glass painting is of the highest quality, especially that of the facial features. Also, these panels show how well Clayton and Bell could respond to the dramatic possibilities of each narrative scene. This provides a welcome contrast to the figurative windows which make up most of the cathedral’s stained glass. In the first lancet the dominant figure throughout the panels is that of the Blessed Virgin. 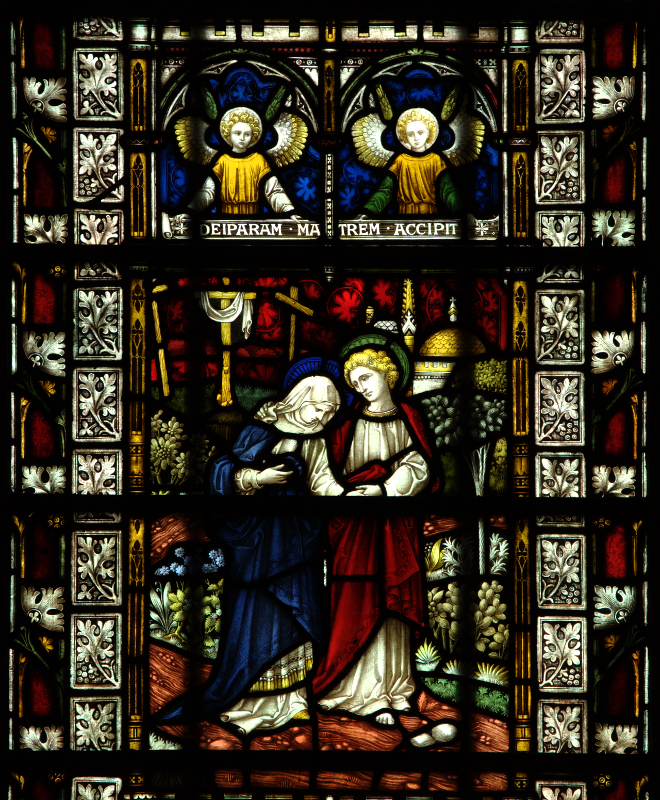 The formal composition of the Annunciation scene is one of the most successful panels in the whole window. It contrasts directly with the Visitation where the tangible warmth between Mary and Elizabeth is flanked by the figures of Joseph and Zachary looking on rather passively as spectators. The Annunciation to the shepherds is by contrast a crowded scene with its humans and flock of sheep dominated by the angel of the Annunciation. Finally the Adoration of the Magi panel has to fit into the narrowing head of the lancet. It is therefore a far more intimate version than the portrayal of the Adoration of the Magi in the Southeast quire transept (S4, Chapter 7). Although the figure of Christ dominates each episode in the other two lancets, there are many subtle visual comments on the ways in which other characters react to the unfolding Passion narrative and drama. The Last Supper’s central figure is Judas, clutching his bag of money. Christ’s ‘Agony’ is so visually dramatic that one wonders how the three disciples could have possibly slept though it. The rabble in the foreground of ‘Ecce Homo’ is suitably roused by Pilate’s theatrical presentation. The eye is drawn to the dignified grief of the Centurion standing at the foot of the Cross, as it is to Mary Magdalene’s face as Christ’s body is taken from the Cross, and her tenderness (with that of Joseph of Arimathaea) as the body is placed in the tomb. The details of what each Mary is carrying to the Tomb are a nice human touch, and the extravagant gestures of the soldiers in their sleep as Christ rises from the Tomb are a commentary on the shattering nature of the event. A final detail is in the Pieta scene, where the shaft of the Cross in the background has an interleafed Celtic pattern that is found on many Cornish Celtic crosses. These windows are best viewed early on a sunny morning, when the direct light reveals the amazing richness of the colours which are often reflected onto the floor of the retro-quire and even on to the back of the reredos. The right-hand lancet presents us with two puzzles. In the Master Plan, the third subject was listed as the Resurrection, while the Ascension was placed at the lancet top. In the completed version this had been altered to showing the three Marys at the empty tomb as the third panel and the Resurrection at the lancet top. Rather surprisingly, the subject of the Ascension does not now appear in any window. Also, why is the panel of Christ rising from the tomb placed after the Three Marys, thus breaking the strict chronological narrative? The answer to this change in plan and the chronological break is directly connected to the previously mentioned fact that the top panels of the left and right lancets are visible above the reredos from the body of the cathedral (the nave and crossing). The height of the reredos means that the lower east lancets cannot be seen from the quire or nave, and the intended link between the upper and lower east windows can be made only if parts of these lower lancets are visible from the main floor of the building. One can only assume that, once the reredos had been installed, a late alteration to subject-matter and order of the right-hand lancet was agreed so that the topmost panels of the left and right lancets showing the birth and rebirth of Christ would be visible from the main body of the cathedral. The chronology of the right lancet was therefore deemed to be of less importance than the theological, artistic and architectural connections between the lower and upper windows. As with the late alterations in the north transept rose window N13 (Chapter 4), it was obviously too late to include these details in the Master Plan before it was published for the cathedral’s consecration in 1887. The recommended route now moves back to the sanctuary rail in the quire. The architectural context of the Great East window is of supreme significance. Whereas all three rose windows are visible from the Crossing only, and the lower east window is hidden by the reredos, the Great East window is the dominant focal point for the whole cathedral interior. Sited above the High Altar and reredos, it is the visual focus from the nave, crossing and quire. Unlike a rose window that acts as an interruption to the vertical perspective, these three lancets direct the eye from the High Altar and its reredos upwards directly to the roof’s vaulting. Its highly detailed iconography is the climax of the stained glass schemes of all of the other windows. Its rich colours are designed to create an atmosphere of mystery within the sanctuary and quire, and are but one part of the elaborate decoration used throughout. Pearson deliberately saved such elaboration for the two parts of the cathedral where the Dominical sacraments are celebrated—the baptistry and the quire/sanctuary.173 In both areas the highest craftsmanship in mosaic flooring, stone carving, wood carving, metal working and stained glass is displayed. By comparison with the self-contained iconography of the rose windows, the Great East window has not only a highly complicated theological text in itself, but one that relates directly to the iconography of the reredos below and, as been shown, to the lower east window. It also relates to the typological iconography of the two quire transept windows (Chapter 7) and to the first windows in the Church History sequence (see below and Chapter 10). E1. The Great East Window. Click on ‘Forwards’ or ‘Backwards’ at the bottom to move through the scenes depicted in the window. The full significance of Benson’s vision can be appreciated only by following the following route through the three lancets. The lowest panels of each lancet contain scenes from the Book of Revelation which expand on the themes of the reredos and lancets of the lower east window. In the central lancet lowest panel directly above the Crucifixion in the reredos, kings offer their crowns in adoration of the Lamb, a reference to Revelation 5. Together with the other Revelation references it points to the end of time. The left lancet lowest panel depicts the Glory of the Lamb and refers to Revelation chapter 19 v.11. In fact it is the glory of the Word of God to the Lamb, I saw heaven open, and a white horse appeared; its rider’s name was Faithful and True … and he (the horse) was called the Word of God. This refers directly back to the image of the Creator Word of the western rose at the opposite end of the building. Revelation 19 speaks of the declaration of the victory of the Lamb of God. The Lamb is a sacrificial image and the victory is consummated by marriage—the wedding day of the Lamb. The wedding is a biblical image of heaven uniting all. The right lancet lowest panel is the Vision of the City of God and is from Revelation 22. The River of Life flows from the Lamb and the throne. The Tree of life has twelve crops of fruit and its leaves are for healing—this could be a reference to the Garden of Eden sequence in the lancets below the west rose. This east-facing window, through which the early life-giving sun shines, implies that there will now be no more night; the Lord God will give them light. The three panels interrelate and are held in a context of offering and worship (angels and censers) recurring throughout the rest of the window. The central lancet: the route through the whole window now leads upwards through the central lancet from the lowest panel, the Adoration of the Lamb. The Blessed Virgin Mary, to whom the cathedral is dedicated, is surrounded by the Holy Innocents who emphasize the theme of martyrdom. Next are the Archangels Michael, Gabriel and Raphael who have already featured in the lancets below the western rose window. They lead upwards to Christ in Majesty, the theological, visual and architectural focus for the whole cathedral. Christ in Majesty dominates the window, bringing life and judgment, as the culmination of faith and worship understood in the offering of soul and body as a living sacrifice (the reredos crucifixion). The positioning of this image in this window above the sanctuary and altar is therefore of overwhelming significance, especially in the context of the celebration of the Eucharist sacrament. At the top of the lancet are doves representing the Seven Gifts of the Holy Spirit176: the virtues of charity, faith, hope, prudence, fortitude, justice and temperance. Again, these have already appeared in the western rose window at the far end of the building. The route now leads to the left and right lancets, which have to be read together, but this time from top downwards. They are a Te Deum setting in three sections, each separated by panels of angels with emblems of the Passion. The three main layers are Old Testament, New Testament and post-Christian themes. 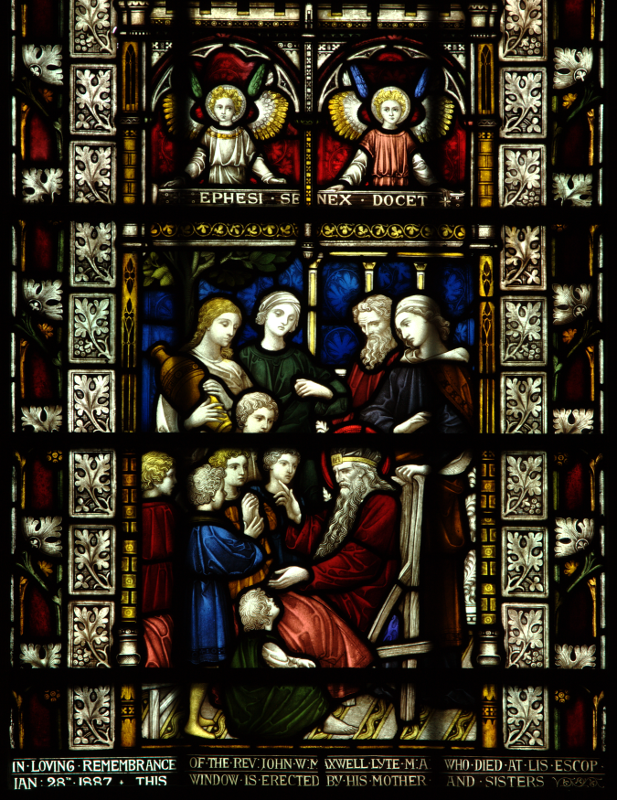 The upper panels are, on the left the Old Testament Patriarchs from Adam to Jacob finishing with Melchizedek, and on the right are the Old Testament Prophets from Moses to John the Baptist. The patriarchs and prophets are complementary, and note that John the Baptist is included as a prophet in both the Old and New Testaments. He is nearest to Christ holding a medallion of the Lamb. Melchizedek, the figure on the inside of the left panel, was of course a King and priest, and is seen as a prefiguration of Christ. This layer of the lancets is at the level of the clerestory windows, which in the original Master Scheme should have been filled with the last of the Prophets and Patriarchs sequence. The middle New Testament panels contain the twelve apostles together with Saints Paul and Barnabas. The apostles are on the same level as the three archangels in the centre lancet and in their different ministries are a comment on the spreading and offering of the Word. The lower post-Christian panels contain in the right lancet the Greek and Latin Doctors of the Church, and in the left lancet a selection of Christian Martyrs, including some Celtic examples. The Doctors of the church are from both East and West, and have banners inscribed with Te Deum Laudamus , linking them with similar banners around the angels above. Therefore, key figures of theological teaching in the post-Christian period are balanced on the other side by the martyrs—word and action. The themes of teaching and martyrdom continue directly downwards to the lancet windows at the end of each quire aisle (n2 and s2), and these two lancets launch the windows of the Christian history sequence. The Great East window is the climax of both the Gospel sequences of the lower east window (e1) and the typological quire transepts (N4 and S4), and what was planned to be an Old Testament sequence in the clerestory, whilst also launching all the Church History windows in the retro-quire, quire aisles, nave aisles and baptistry. It is the architectural focus for the whole of the cathedral’s interior with its vision of the end of time. Together, the rose windows and the Great East window now form a complete statement of Christian belief and hope, using the extremities of the building to great dramatic effect. So, even at this early stage in the design, some criticisms over the perception, understanding and interpretation of the windows were anticipated. However, one imagines that both Pearson and Clayton and Bell, in realising Benson’s and Mason’s vision, also had in mind the immensely detailed east windows of other cathedrals in the Southwest, such as Wells and Exeter, where such considerations did not seem to trouble the medieval mind. The recommended route now goes back to the retro-quire, where the two east lancets of the quire aisles need to be read as an integral part of the east windows and as part of the Church History sequence. n2. Sacred to the memory of Sir Joshua Rowe C.B. Chief Justice of Jamaica from 1832 to 1856. Died 30 October 1874. 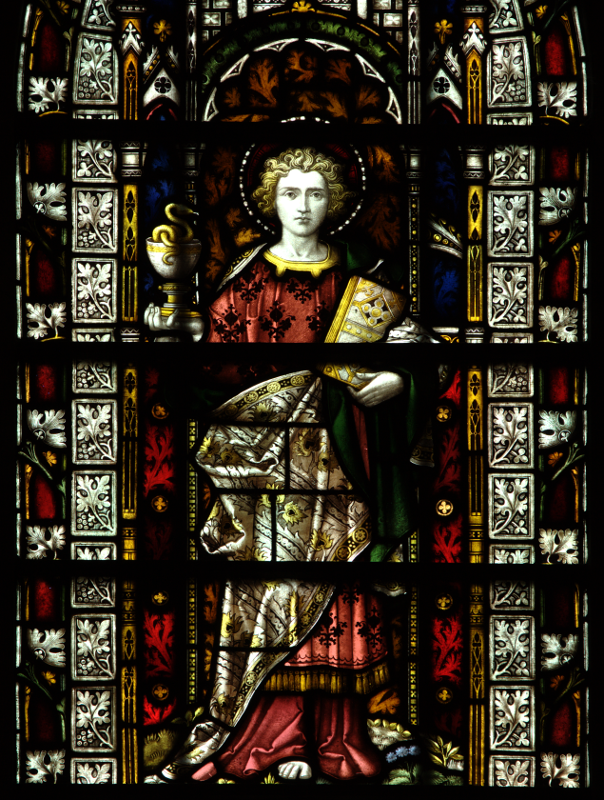 This window is erected in affectionate remembrance by his widow. n2 3. 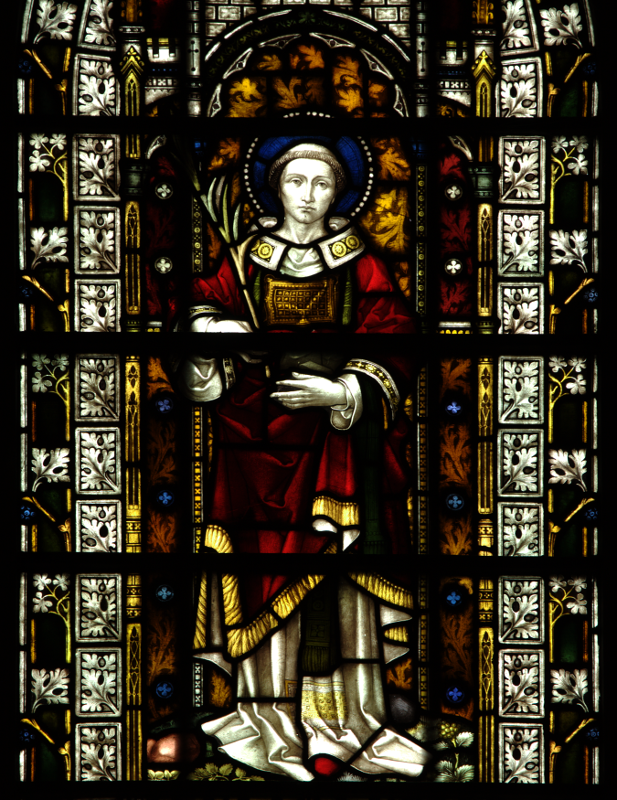 St Stephen holding, in his left hand, a Gospel Book and, in his right, a martyr’s palm frond. n2 2. Perorat coram concilio (He makes a speech before the Sanhedrin). n2 1. Sub imbre saxeo obdormit (He goes to sleep under a shower of stone). s2. In loving remembrance of the Rev: John W: Maxwell Lyte M:A: who died at Lis Escop Jan: 28th 1887 this window is erected by his mother and sisters. s2 3.. St John the Divine. In his left hand he holds a book, probably a reference to St John’s gospel, and in his right a chalice from which a serpent is emerging. s2 2. Deiparam matrem accipit (He takes his mother, the Mother of God). John leads the Blessed Virgin Mary away from the cross. s2 1. Ephesi senex docet (The old man teaches at Ephesus). The two lancet windows at the eastern ends of the quire aisles (n2 and s2179) have as their subjects Saints Stephen and John the Divine. At first sight they appear to be part of the Christian History sequence (Chapter 10). However, for a number of reasons, there is a strong case to be made for including them as part of the analysis of the Eastern windows. Firstly the lancets contain only a single figure, in contrast to all the other ground-level lancets which have a grouping of three subjects, what Mason termed speaking groups 180 Secondly, they have two predellas compared with a single scene in all the other lancets. Thirdly, they are so sited as to be visible for the whole length of the aisles and therefore have a heightened architectural and theological purpose. Finally, and most significantly, the Master Scheme of 1887 identifies the saints in such a manner as to relate them directly to the content of the great upper east window (E1) above. There can be no doubt that n2 and s2 were intended to link the post-Christian panels in the lower outer lancets of the Great East window above (Doctors and Teachers of the Church, and the Holy Martyrs) with the sequence of Christian History windows at ground floor level. Of the windows themselves, there are further layers of meaning, and as we shall see in the Christian History sequence, the choice of the scene for the predella is usually the key to unlocking the window’s subtext. 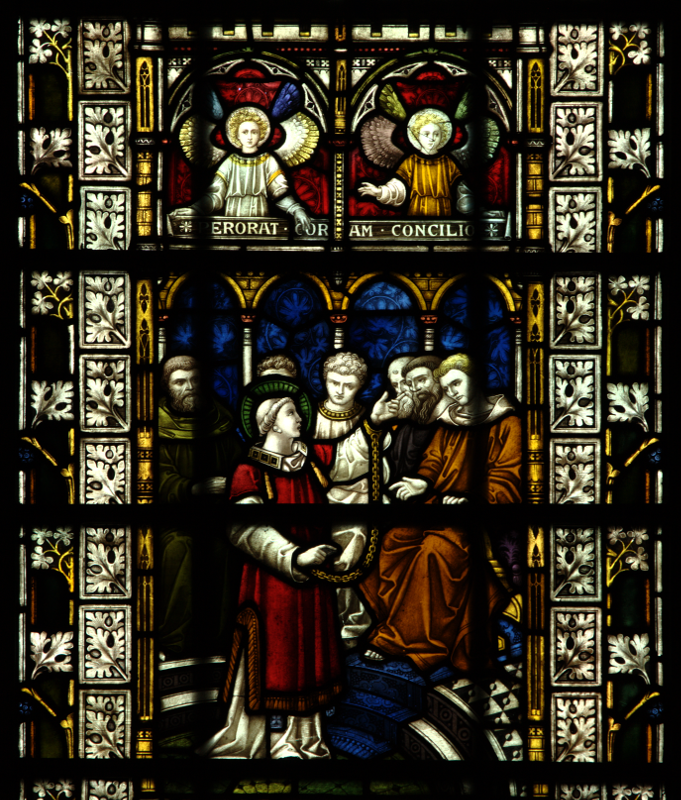 In the St John lancet, the predella showing him leading the Blessed Virgin Mary away from the Cross specifically emphasises the Marian connection in her place in the centre lancet of the great east window, and, through her position as patronal saint to the old St Mary Parish Church and the new cathedral, her dominant presence in the cathedral windows generally. The choice of the subject matter in the predellas also resonates with other key windows. The testimony of St John’s Gospel has already been shown to be crucial to reading the western rose (W1, Chapter 4), and the scenes from the Book of Revelation referred to in the second predella are the gateway into the Great East window (E1). This chapter reveals how all these windows at the eastern end of the cathedral, both at ground level and upper level, are parts of a complex whole. They would have formed the climax of the schemes of all the upper level windows had they been fitted, as well as leading to the lower-level sequence of windows. As an entity they form the visual, theological and architectural focus for the whole building. The Great East window is the climax of the iconography of all the other windows, and together with the quire transept windows plays an essential part in the cathedral’s pattern of liturgy and worship. NCA DD/716/75/251 note from Benson to Mason. CCRO TCM/880/1–2 Printed list inserted in order for Cathedral’s consecration, November 1887. Both e1 and E1 were donated by the Deanery of East [sic]. The costs were £500 and £1,000 respectively. It was a donation to the Cathedral by Athelstan Riley in the 1920s from a monastery in Brittany. CCRO DCT/9/25 quire floor designs: DCT/P/121 quire canopy designs; DCT/P/134–5 quire stall designs: DCT/P/240 and 247 sections of Baptistry and Baptistry vestibule. All signed by JL Pearson. Truro Cathedral occasional monograph No 2, The Reredos, Canon Perran Gay, 2010. This is a piece of glass that was temporarily inserted in 1945 following accidental damage. It has never been replaced with more suitable glass that matches the rest of the window. Summa Theologica Ⅱ.2, Thomas Aquinas asserts these correspondences between the seven Capital Virtues and the seven Gifts of the Holy Spirit. CCRO TCM/435 Minutes of the Executive Committee, 24th August 1886.
s2 was donated by Mother and Sister in memory of Revd John Maxwell Lyle, and inserted in 1888. n2 was donated by Dame Frances Anne Rowe in memory of Sir Joseph Rowe, Chief Justice of Jamaica, and inserted for the consecration of the cathedral in November 1887. CCRO TCM/1049/3 Letter from Canon Mason (Canterbury) to Chancellor Worlledge 25th June 1896. Acts 8, v. 51 .